Lovely corner unit with all one side louvered windows to let the outside in! Recently upgraded with gorgeous granite counter, all new appliances and tile through out! Unit has unique four poster bed, walk in tiled shower, AC in living area, in suite Washer/dryer. Free onsite parking, wireless internet, basic cable and local phone! We had a very pleasant stay - similar level of comfort as the expensive resorts down the street at a lower cost. A guest from Delta, BC Canada recommends this vacation rental. What a great place,and even better location! End ground floor unit privacy and the ocean right off the lanai. A guest from Ste. Therese., QC Canada recommends this vacation rental. Such a great location and comfortable apartment. The reservation process was easy and pleasant. So glad you enjoyed your stay! See you next time! This Kaleialoha corner unit was beautiful and provided a great combination of privacy, beach access, and location for our vacation on Maui. + The condo was very clean, and everything was in good condition. + Excellent view of the sunset, as the condo faces west. + Well stocked with dishes and kitchenware for cooking in house. + Well stocked with linens, towels, etc. + Some beach supplies were provided, like boogie boards, chairs, and a snorkel mask. 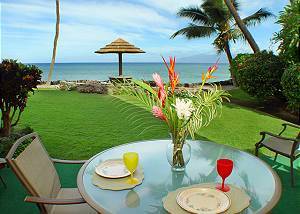 + The patio table and chairs provided a great place for meals at home with a view of the ocean. + Good information on local restaurants was given. - As a corner unit, the north windows face the neighboring condo complex, which can get pretty noisy. - In the warmer/more humid months, it can get quite warm, especially in the bedroom. - No direct beach access; although there is a (beautiful) view of the ocean from the condo, the closest beach access is about a half mile south. - WiFi was provided, but we didn't realize it until our last day because the network name and password was only printed on a small sticker inside the information binder. Making this more visible would really help! Aloha! Mahalo for your comments! I will make the WIFI code more visible as you suggest. There are stairs on the south side of the property leading t0 the beach over by the BBQ area. Kind of hidden as well unless u happened to walk down there! Glad you enjoyed your stay and hope to see you again! Beautiful ground floor end unit with shaded lanai. Nicely furnished with an extra wall of windows & lots of light due to its end location. The kitchen came stocked with everything we could possibly need for our stay. The in-unit washer/dryer was a definite bonus. We loved that it included cooler, beach towels, & gear for enjoying the beach. It was super clean, comfortable & felt spacious. The owners had excellent communication, some of the best we've had when traveling. We would definitely recommend it and come back again. Lea R. from Houston, TX United States recommends this vacation rental. We had a short stay but the condo was Excellent!!! So glad you enjoyed! see you next time! We have stayed at Kaleialoha four or five times now and we always enjoy it. It's very convenient and comfortable. We'll be back soon. Great Place to stay with amazing views! Mark F. from Lahaina, HI United States recommends this vacation rental. The condo was very nice and private. Had amazing views with the waves just crashing up on the rocks along with beautiful sun sets. You got to see many sea turtles right from the out door space of condo. Everything was updated. We had a great stay in Maui and the condo helped us achieve that. We would stay there again. Kristine M. from St. Louis, MO United States recommends this vacation rental. Although most of you time was spent touring the island this was a wonderful home base. We loved waking up and going to sleep with a glorious visual and sound of the ocean. A guest from Kirkland, WA United States recommends this vacation rental. Beautiful week on Maui. Perfect weather,great location. Plenty of whales to watch.would have been if there was a decent pair of binoculars in the unit. Amazing! View from lanai was beyond beautiful, with spectacular sunsets every night. Kitchen was perfect and has everything you could possibly need, with the most gorgeous countertops I have ever seen. Bathroom was perfect for 2+ with huge shower, beautifully tiled. Bedroom was great with big bed. BBQs were major plus for us, and always clean and available to use. Pool was prefect. 3-5 minute walk from anything you need at farmers market, grocery store, restaurants, espresso, snorkeling equipment rental, and park for swimming/snorkeling. We were sad to leave! Judy V. from United States recommends this vacation rental. Amazing...relaxing...everything you would want it to be. Our only thoughts would be that the kitchen dishes and utensils were not very clean, like as if they were put in the dishwasher with food caked on and didn't get clean,I spent unwanted time scrubbing dishes. Also there were cobwebs and filth in cabinets, We are in Hawaii I expect bugs but not their leftovers...and it's ridiculous that they only stock 2 rolls of toilet paper for a week stay. As far as furniture the master bed is in desperate need to be replaced. and we wished there was a jacuzzi. Aloha Judy and Mahalo for your comments. We will look into all items! see you next time! Rick C. from Parker, CO United States recommends this vacation rental. First time going the condo rental route (we've always stayed in a "resort" on our prior six visits). Separate bedroom, (fully stocked) kitchen, TV/sitting area, computer table & Wi-Fi, and lanai a few feet from the ocean- much more room for 1/2 to 1/3 the price of a single resort room. Quiet setting, recent (nicely done) renovations. It was absolutely what we were looking for. Can't understand why we haven't chosen this path before. We will in the future and will specifically look for this unit's availability. Tim R. from Lahaina, HI United States recommends this vacation rental. The location on the corner gave us additional privacy and being on the bottom floor we really enjoyed the freedom of walking to and from the beach. The outside pictures are very accurate and the grounds are beautifully manicured and the view is magnificent. We watched turtles and whales and would highly recommend this condo. shereen g. from calgary, alberta Canada recommends this vacation rental. This condo is perfect in every way. We have stayed now three times in this unit and each time love it even more !! Cynthia W. from lahaina, HI United States recommends this vacation rental. Great property, very clean, beautiful!! We had no problems or issues. Loved it! A guest from Corvallis, OR United States recommends this vacation rental. Very nice area with easy to get to beach. Very private which was a plus for my husband and myself. All the comforts of home in a beautiful setting. We enjoyed our stay immensely. Robert S. from Lahaina, HI United States recommends this vacation rental. Waking up every morning to the birds chirping, swimming in the ocean with the sea turtles and enjoying the bright colorful sunsets nightly was magical. The condominium was perfect in every way, we felt right at home and enjoyed the beautiful soothing ocean views daily for hours. An absolute wonderful 9 day stay! Jennifer O. from Los Angeles, Ca United States recommends this vacation rental. This unit is great! Very nice, cozy, clean and convenient! The best part is the view. I cannot fully express how wonderful it was, you just have to go with blind faith to experience how it feels. Your backdoor has a beautiful ocean view, steps away from the beach and privacy. On days we did not have excursions, we bought take-out for breakfast/lunch/dinner to eat at our lanai - so awesome. Make sure if you take your family to tell them there is no internet access (there is however) so they leave most of their electronics at home. They may get mad the first day they realize there is internet but in the end, they can enjoy Maui's beauty and serenity. My kids did. I cried on my last day because I could not believe it was over but can't wait until my next visit! Mahalo for your wonderful comments! See you next time! gary r. from Lahaina, HI United States recommends this vacation rental. Mahalo for taking the time to respond and we will see you next time! John B. from Mills River, NC United States recommends this vacation rental. Our experience here has been delightful!! The unit is clean, up to date and in a great location to walk to the markets, seaside parks and restaurants. We are return renters for all of these reasons! Wally G. from Gig Harbor, WA United States recommends this vacation rental. Corner unit, with extra windows provides more light. Clean, comfortable and quite! We have stayed at the Kaleialoha many times. This is our first experience renting #115. We will be back and we will absolutely request this unit again. Love ya Wally! See you next time! Harold K. from Aurora, Ontario Canada recommends this vacation rental. As the title suggests ...the unit was as advertised. I actually thought the ocean views were too good to be true but when my family got there, the view was as advertised! Just beautiful! Great to wake up tobthat view and relax every morning with a cup of coffee. The location is perfect. You can go out to your own little beach or visit many others a short walk away or drive. You can see a few turtles around the beach and see some fish if you snorkel near the rocks to the side. There was a 3rd floor available but we decided to take the main floor. Great to just walk out to the lawn and relax on the chairs. The balacony offers same view but to have a full lawn to walk out to was better. We were advised by friends to take an upper floor for safety concerns but I felt comfortable. The unit itself was clean. Our unit 115 had a washer/dryer which was convenient. For other units, there is a laundry room on main floor. There was an AC unit that was sufficient for the open area but it did not go all the way to bedroom. But it came with two small fans on the dresser which provided some cool factor in the evenings. Lonelle (Lonny), the property manager was very responsive from the get go. I originally booked a unit without AC and I emailed about my concern and she replied right away and arranged a unit with AC. Overall, I would give this experience a 4.5 out of 5. The only critique and aspect that prevented a 5 was that the unit was a bit dated. Overall, my family was very satisfied and we would rent this condo again! Mahalo and hope to see you again! Ask for our repeat guest discount! Scott B. from Seaside, CA United States recommends this vacation rental. A guest from Alexandria, KY United States recommends this vacation rental. I have nothing but good things to say about my visit,the condo 115 was very beautiful and stocked with all you need. The views are fantastic and I was lucky to see many whales right from my lanai. Well managed by helpful Lonnie who was a big part of making my visit so great with her suggestions and recommendations. I hope to return. Robbie J. from Southampton, Hampshire United Kingdom recommends this vacation rental. The apartment was clean and well fitted with new appliances. The view from the breakfast table was perfect we could walk 10 paces and watch sea turtles swimming over the reef. Roger C. from Long Beach, CA United States recommends this vacation rental. We had a great time and the unit was perfect. Loved being on the ground level. Had a beautiful view and loved the location, we walked every morning. We will be back! James A. from Independence, MO United States recommends this vacation rental. Loved the condo, and would definitely stay again. Short walk to farmers market. Everything was clean and well maintained inside and out. Gas grills were even cleaned daily. Much cheaper and more comfortable than a hotel/resort. Hui Ka W. from Hong Kong Hong Kong recommends this vacation rental. Everything is prefect. It just like a second home. James & Julie B. from Paso Robles, CA United States recommends this vacation rental. The location of this unit was terrific! We had the trade winds blowing through the windows, had an incredible view and everything we needed was there. This Ocean Front Unit was more than expected. The staff was helpful in providing info to dining around the island and giving directions. We will definitely stay here again when given the opportunity. Marisa G. from Medford, New Jersey United States recommends this vacation rental. Mary M. from Auburn, WA United States recommends this vacation rental. What a wonderful experience and will book again to stay there. Everyone was very friendly and helpful. A guest from Houma, LA United States recommends this vacation rental. Loved everything about it!!! Would definitely stay in Condo #115 again!!! A guest from Winnipeg, Manitoba Canada recommends this vacation rental. Condo was wonderful. The view is incredible. Enjoyed being on the main floor and having a nice patio area. Watched the whales daily! A guest from Honolulu, HI United States recommends this vacation rental. The only adverse comment would be that the dishes seemed to have been put away wet so they stuck to each other. Also the unit was extremely dark the owners chose very dark furniture and fixtures. We live in a similarly sized unit in Waikiki and ours is very light. Mike F. from Alpine, CA United States recommends this vacation rental. Awesome, beautiful property and well maintained. Staff was excellent. Anything I needed to enjoy my vacation was onsite in my unit. I did not want for anything that was not provided. I will go back again. Views are like those in TV commercials. A guest from Ca, CALIFORNIA United States recommends this vacation rental. This condo is truly amazing! Great location, fully updated and we loved having the corner ground floor unit. We had three condo's there, but this one was the best to use for our Thanksgiving feast. Plenty of room on the lanai to fit all of us and the kitchen had everything we needed! Lonnie was great to work with - only positive things to say! A guest from Rapid City, IA United States recommends this vacation rental. It was a beautiful condo with a great view. I booked on priceline and was suprised when I saw my credit card and found out their was a 95 dollar cleaning fee we were only their one night. Great stay and weather...have stayed at this complex multiple times, first time in 115... is great! like the privacy of the end unit, ground floor access...ocean/sea wall 25 feet from our patio. Capt. Steve's Whale Watch trip is the best, did it twice, go on the a.m. trips for smoother water...overall, another great stay at the Kaleialoha!! A guest from Manchaca, Texas United States recommends this vacation rental. This place was absolutely beautiful! The location was perfect. We saw sea turtles every day and even a school of sting rays. Every single morning was gorgeous and the beach was right outside to enjoy every day. The condo was the perfect size and beautifully decorated. I will definitely be back as soon as I can! A guest from Port Orchard, WA United States recommends this vacation rental. Clean, very well maintained, nicely updated unit. Outstanding ocean views. Beverly M. from Seattle, WA United States recommends this vacation rental. Just steps from the water. Corner unit is very private. Beautifully decorated. Everything we needed for cooking. Even saw whales off shore from the condo. Great condo, great price, excellent location! Michael F. from Anchorage, Alaska United States recommends this vacation rental. Clean, quiet, steps away from the ocean. We saw sea turtles and dolphins from the patio! We will definitely be back. John C. from Riverside, CA United States recommends this vacation rental. Great property location within close proximity to grocery stores a eateries. Love watching turtles every afternoon on the reef and the sunsets in the evening during dinner. Only negative was that upon arrival was that the room air was not on to give us a cool room during arrival. Really excellent! Place was clean and had all the amenities, not to mention great beach access and view of the sunsets. Would love to stay there again. Parking was more than adequate, too. A guest from Greer, SC United States recommends this vacation rental. We had a great week staying at Kaleialoha! An ocean front, ground level was perfect. Leslie A. from Carlsbad, CA United States recommends this vacation rental. The condo was in an excellent location. We sat out on the Lanai and enjoyed the beautiful view of the ocean and the crashing waves. In the early evening as the sun went down we were able to see a double rainbow arched across the sea, what a gorgeous site. We all had such a wonderful stay. Luckily we were able to check in early! Lonnie was very nice and helpful. Very clean and quiet place! First impression upon walking into the condo was the view straight out to the ocean. Even though we were on the bottom floor the view was breathtaking and we loved that we were able to walk from our lanai straight to the water... We ate breakfast outside every morning... We definitely will be back. It was a great condo, more than we expected!! A guest from Abbotsford, BC Canada recommends this vacation rental. This being our first experience with renting a condo, we were a little timid, but Lonnie and Cathy were awesome in assisting us with all of our questions. The property is older, but it is kept up so nice. It's quiet and located in a quieter area. You can watch 6-7 turtles right outside your lanai and whales too! We loved the end unit with the windows on the side. The unit could use some updating with a king bed and the cabinets in the kitchen, but other that that, it was perfect. So perfect we have already booked 2 weeks in Feb 2013! Brenda C. from Vancouver, WA United States recommends this vacation rental. Wonderful. We arrived on a Sat. found our key went to our unit, fans were on,windows open and a box of chocolate mac nuts on the counter to welcome us. Book of directions very helpful. This corner unit is very private and I loved all the windows. There was some noise from the complex next door but it was managable. It was clean and comfortable. Everything we needed was there. I will be returning to Kaleialoha when I come back to Maui. It was great. Being on the ground floor was the best. Get up grab a cup of coffee and go out and watch whales, turtles or just the ocean. I loved it there and so did my husband. Mahalo for a great time. Samantha M. from Portland, OR United States recommends this vacation rental. It is a perfect place to have little ones! Chris M. from Graham, WA United States recommends this vacation rental. Our Vacation Rental was great. Everyone was very friendly and the complex was beautiful. This was our 2nd time staying here and will surely stay here again. Janis D. from Chehalis, WA United States recommends this vacation rental. We had a great time at the condos. 115 was perfect for our family. the views were great, we watched whales from our Lanai nearly every day. We saw turtles, eels, birds. We snorkeled right out from the grounds as well. The sunsets were amazing. The grounds were quiet, well maintained. We are counting the days until we can make it back. Laura N. from Los Angeles, CA United States recommends this vacation rental. Best condo I ever stayed in Maui. I thought Mahana was great but this one is greater. I will stay at the same condo again if I go back to Maui again. Thanks to the staff made my vacation completed. We had an excellent time could not have been better. Couldn't have chosen a better place to stay! Lisa R. from Bellevue , WA United States recommends this vacation rental. We loved our view and the sound of the ocean so much we rarely left our lanai. A great find in Maui. Donald L. from Woodinville, WA United States recommends this vacation rental. Great place to spend time. Overall experience was fantastic. Unit, grounds, pool, all were great. Enjoyed Kaleialoha very much, and recommend as a destination. Kara C. from Independence, MO United States recommends this vacation rental. When we arrived we looked around for about 10 minutes trying to locate someone to check us in, no one was at the desk, or in the managing apartment. It turned out she was preparing our room. The location was Greta, just a couple minutes from the action of Lahaina. Very calm and relaxing atmosphere. A guest from Vancouver, WA United States recommends this vacation rental. good place, friendly staff, close to good beaches and shopping. Hidden Gem and a view to remember! Kathleen T. from Jacksonville, Oregon United States recommends this vacation rental. What a great place! Well run and beautifully maintained. Our unit was perfect, recently remodeled with everything you could want. The whales put on a show for us every day. Can't imagine why you would pay two or three times more and get only a hotel room with no view. Directly on the water, listen to the ocean all day and night......and what a view! This place is a real find!!!! Everything was wonderful, the view, the condo, the privacy, the location, the amenities, the proximity to shopping, beaches, and on and on. We will definately be back! The property was in a central location that worked great for us. The grounds were very clean as was the interior of the unit we rented. Being so close to the water was great for snorkeling or just playing in the water. We saw numerous turtles swimming by every day. Definitely a place I would consider for a return stay. clean, easy access, amazing view, beautiful accomodations. my only suggestion would be to invest in a new mattress for the bed otherwise perfect. Awesome view and a memorable stay!!! A guest from Candiac, Quebec United States recommends this vacation rental. 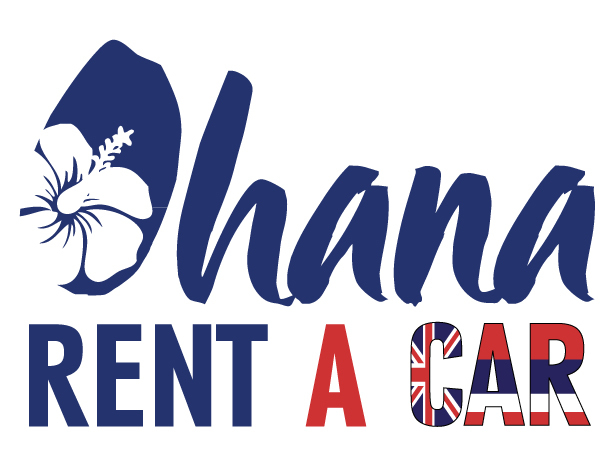 If you ever wondered whether to book a hotel or a condo for your stay in Maui, you should definitely save the extra money and rent the condo!!! Not only for the money, but simply for the beautiful and memorable view! This made the whole difference for our trip! every night we would rush back to the condo to see the exceptional view of the sunset! All worth it and so accomodating. The staff are very efficient and cordial and the place was perfect for the two of us!! Jason N. from Lehi, UT United States recommends this vacation rental. Loved this ground floor unit with easy access to the ocean, great location! Erik H. from Portland, OR United States recommends this vacation rental. Once the plumbing issue was resolved, everything was perfect. We can't wait to come back to the exact same place. Great turtle and whale watching from the lanai. Nhung P. from Lowell, MA United States recommends this vacation rental. John H. from Chicago, IL United States recommends this vacation rental. The picture of the "Million Dollar View" doesn't even do it justice! Absolutely breathtaking. We had a wonderful stay (too short of course) and plan on returning! The unit was spotless and we really appreciated the welcome chocolates and the binder with lots of helpful info about the property and the island. Thank you so much for making our vacation perfect! Mahalo!